In early autumn 1882, RLS was “ordered south” again. He had first been ordered south to Menton in 1873 on Dr Andrew Clark’s insistence. Now, Dr Clark recommended that he stay in the South of France again for the winter. Because Fanny was too ill to travel, Bob Stevenson and RLS headed south to find somewhere for RLS to stay. RLS was first in Montpellier, then Marseille, then Nice, and back again to Marseille. He next travelled to Hyeres, where he would stay from late February 1883 until early June 1884. At the time, Hyeres was a popular winter health resort. RLS was very happy there, and loved the beauty of the landscape. He was also working hard at his writing: during his time at Hyeres he worked on Prince Otto (1885), The Black Arrow (1888), and A Child’s Garden of Verses (1885). He also corrected proofs of Treasure Island (1883) and Silverado Squatters (1884), and started to plan More New Arabian Nights: The Dynamiter (1885), among other writing projects. While settled here, RLS did occasionally visit other places. For example, in July and August 1883, he went to Vichy, Clemont-Ferrance, Royat and Lyons. On 24 February 1883 RLS and Fanny moved from Marseilles to the Hotel des Iles d’Or, Hyeres, Provence. He stayed in the hotel until 22 March 1883. 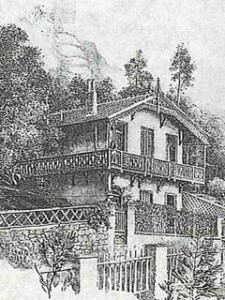 RLS and Fanny moved to Chalet la Solitude, 4 Rue Victor Basch, Hyeres, on 22 March 1883. They would stay here (with occasional visits elsewhere) until June 1884, when a cholera outbreak meant that RLS had to leave. He went to Royat, stopping at Marseilles on the way. After spending most of June in Royat, he was briefly in London before settling in Bournemouth in mid-July 1884. Although RLS was happy at Hyeres, he was often gravely ill. In early January 1884, W.E. Henley and Charles Baxter were visiting the Stevensons at Hyeres. Chalet la Solitude was not suitable for so many guests so on 12 January the party left for Monaco, Monte Carlo and then Menton. On their return to Hyeres, they stayed in Nice (from around 20 January – 16 February 1884). (Letter from Fanny Stevenson to W.E. Henley, 2 May 1884, The Letters of Robert Louis Stevenson, ed. by Bradford A. Booth and Ernest Mehew, vol iv [New Haven: New York, 1995], p. 288). According to Ernest Mehew (The Letters of Robert Louis Stevenson, vol iv [New Haven: Yale University Press, 1995]), this was the ‘worst hemorrhage [Stevenson] had ever experienced” (p. 289). RLS’s friends took quick action. At the urgings of W.E. Henley (who Fanny had telegraphed), Charles Baxter and Bob Stevenson arranged for Henley’s doctor, Zebulon Mennell (1851-1911) to go to Hyeres and to replace Dr Vidal. Dr Mennell stayed with RLS from 7 May to around 13 or 14 May. RLS referred to Dr Mennel as “the pirate”. Stevenson eventually recovered, but it was an anxious time for RLS’s friends and family: Fanny had been unsure about what to reveal to RLS’s parents and they only heard about his illness after the worst danger had passed.